We had an art trip to Edinburgh on Friday to see the British Art Show 8. I felt like a school girl again being on the bus with everyone. Let’s just say I’m not a morning person when lacking my usual caffeine intake! It was lovely to get away from Newcastle to a city as stunning and creative as Edinburgh. I am completely in love with the city and it’s architecture, everywhere you look there is something new to absorb, especially when the sun is shining and dancing across the beautiful buildings. 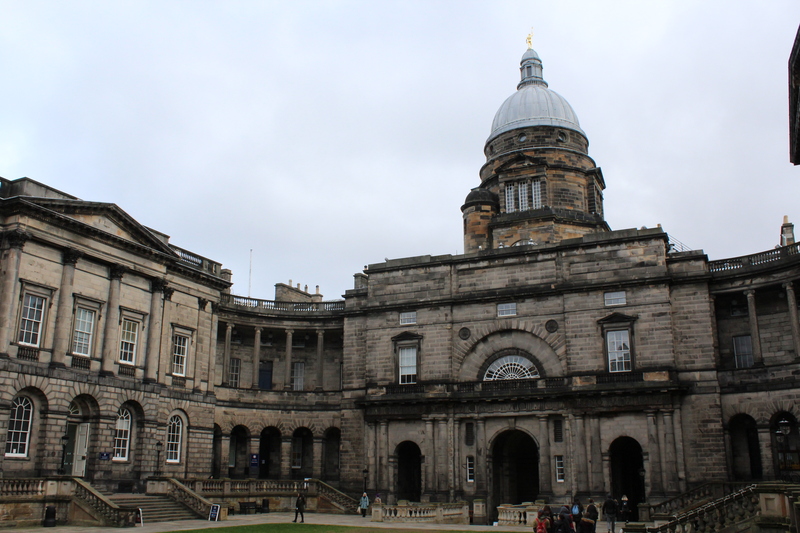 The gallery buildings we were visiting, such as The Talbot Rice Gallery, University of Edinburgh (pictured above) are visually captivating enough in themselves – and that’s before we’d even seen the work in the show itself! The British Art Show takes place every five years and is an exhibition that tours nationally to show the most current contemporary art in the UK today. It hosts a broad variety of artists all of whom work across various media. The theme of the British Art Show this year was materiality and how we approach it both virtually and physically in contemporary art. Initially I misread the text accompanying the exhibition and took it to mean the theme was materiality alone and was consequently disgusted by the ridiculous excess of screens. Not joking, there were more video works in that show than I’ve probably witnessed in my life! In my outrage at this approach to materiality I felt disillusioned by the entire show, until I came to realise my mistake. However, despite the theme being an exploration of materiality across the real and the virtual, I did find the predominant selection of video works quite difficult to absorb. Drifting from screen to screen to screen did start to feel slightly repetitive and exhausting. This is the problem with an excess of video in a gallery setting. You walk in at the wrong time or half way through and the narrative is entirely lost on you! In some cases this approach to viewing video is a success, in other cases it is far from that. Half the time you have no idea of the duration so you are forced to decide when you leave or if you stay and then of course you have all the social pressures of that situation in a gallery setting. You don’t want to be the first to leave the art work, or you don’t want to hurriedly get up when you’ve only just sat down. It can lead to a multiple of awkward situations. That is why I loved this piece ‘The Common Sense’ by Melanie Gilligan so much. There was no issue of when to stop and start viewing. Given the absence of the conventional dark space for viewing video work, I felt under far less pressure and therefore was more inclined to participate with the piece. Partially because I was fascinated by the technology. I put the headphones on expecting to hear things straight away, but it wasn’t until I was in close proximity to the screens that any sound was audible. As you approached each screen you were greeted by a different segment of the film and it’s audio. Yet as you walked between screens you could hear nothing but silence. It was all done through motion sensor and created a highly intriguing experience. Unless of course you didn’t have headphones, then you just felt lost and disinterested. Being lucky enough to have claimed a pair of headphones, ‘The Common Sense’ seemed like a fascinating dystopian film which I would have loved to have been able to see all the way through! Also in The Talbot Rice Gallery was this work by Eileen Simpson and Ben White. In the above image, it doesn’t look like much, apart from being a selection of funky coloured record players. However in reality it was an engaging sound installation that echoed throughout the top floor of the gallery. The records played a compilation of extracts taken from chart hits of 1962 – the final year in which commercial records could be retrieved for public use. It sounded like a hollow and empty kind of disco, like you almost wanted to dance and party but the robotic tone was stopping you from letting loose. Sound installations along with video seemed to be core motifs to the Show. The above image is a gravestone bench by Alex Kane, which was in the room of Laure Prouvost’s haunting sound work. There was a silky woman’s voice reverberating across the room as I sat down, the kind of voice that makes the hair stand up on the back of your neck. At first I thought the bench was part of Prouvost’s work, until I read the accompanying text. Although the sound installation was a generic address to the viewer, it felt like the woman’s voice was pinpointing and talking to directly to me. Incredibly haunting and eerie enough that I left that room with my skin crawling. Although The British Art Show was less sculpture filled than I’d expected, it was rich in experience. I left each room with new thoughts and feelings racing through my head, different things making me uncomfortable or mesmerising me into staying. Sometimes I feel contemporary art should have the simple title of ‘experience art’, as that was definitely what I felt the British Art Show was; an experience.